Today I want to take a closer look at the Salomon Quest 4D 2 GTX Hiking Boots. I did a short review on the older version of these boots and it stacked up well so I was interested to learn more about the new, and I assume improved, version. A versatile pair of hiking boots, the Salomon 4D 2 GTX hiking boots for men will cover most hikers needs all year round. There's a lot in them, functional with a technical style and feel. As mentioned above, the Salomon Quest 4D 2 GTX Hiking Boots are an upgraded version of the original Salamon Quest 4D GTX boots. The older 4D GTX boots were a top seller and proved very popular, so it was interesting to take a closer look at the newer version to see what they would be like. They are priced in and around $230.00 so moving into the higher range for a pair of hiking boots. This latest version of these boots feature the same technical look about them as the older ones. The upper is made from a mixture of waterproof nubuck leather and Gore-tex. The outsole features the Salomon 4D Chassis construction which provides a lot of good grip on all types of terrain on the trail. The Salomon logo appears on the side of the boots, but nothing too in your face i.e. it is tastefully featured on the side of the boots. All in all the boots look pretty good and, as with the previous version, I do like their technical look. Iguana Green and Collapsing Waterbottle. Some of the names of colors makes me wonder sometimes, I'm not entirely sure how something looks like 'Flashy-X' or 'Collapsing Waterbottle', but hey, I guess they've got to give some interesting color mixes names of some kind 🙂 The aesthetics of the Salomon 4D 2 GTX overall score well and the boots, on first impressions, seem very solid. As with the previous version of these boots, they feature most thing's I'd look for in a decent pair of hiking / backpacking boots. So, with the introductory overview complete, let's take a closer look into the usual key areas to see what more we can can learn. Starting with comfort, the insoles on the Salomon Quest 4D 2 GTX Hiking Boots come in the form of a Removable EVA foot bed. EVA is an acronym for Ethylene-vinyl acetate (EVA), also known as poly(ethylene-vinyl acetate) (PEVA). Not to go into too much detail, but EVA is basically a dense foam which can be easily adjusted to the contours of your feet. EVA is also an excellent and durable shock absorber and is an industry standard in many types of shoes especially those used for outdoor activities, running, and so on. The foot bed is of course the part of the boot that the soles of your feet touches. Overall, this type of foot bed, supported by the 4D Chassis construction which we look at later, provides decent protection to the soles of your feet from all manner of terrain on the trail. As it's removable, you can take them out after a tough day's hiking to let them breathe, a definite 'nice to have'. The featured Ortholite sockliner helps to create a cooler and drier environment for your feet so all in all, between the EVA and the Ortholite, you've got a comfortable cushioning directly around your feet. The collar of the Salomon 4D 2 GTX boots are thick, padded and run quite far up the ankles. These boots are primarily designed with backpackers in mind so good ankle support with a heavy load is a must. We'll look at that further in another section below. The tongue of the boots is of course also padded, as per the photo below, as well as gusseted. A gusseted tongue means that the tongue of the boots is connected to the upper of the boots by a material bridge. This is something I personally look for in hiking boots, any help to keep unwanted debris out of my boots is a good thing in my opinion. In terms of a comfortable and secure fit, as these are fundamentally designed as backpacking boots, the lacing needs to work well as you definitely don't want to be bending down to do your shoes up on a regular basis with a heavy pack on board. By most accounts from many users, the lacing system on the Quest 4D 2 GTX boots works pretty good but you will need to use a double knot or two. Nothing strange with that. Looking into the lacing system more closely, as you can see in the photo below, the lace eyelets look tough and secure but, as with the core design of these boots, are constructed using lightweight materials. Now, that would be one thing I would be a little concerned about, plastic eyelets can break much easier than metal ones. However, in terms of the fundamental design purpose of these boots, it makes sense i.e. plastic is lighter in terms of weight. However, I did come across some people reporting that the plastic eyelets broke pretty easily. All in all, it could be a trade off but it's something to keep in mind. The Salomon Quest 4D 2 GTX boots are waterproof and breathable via their mixture of Gore-tex and nubuck leather. For general waterproof protection, from reading user reviews, the boots perform well. From crossing a creak to walking in muddy terrain or snow, to a reasonable level, you will be good and kept dry. In terms of breathability, the boots perform well. Made with Gore-tex as a main constituent material, you would expect that to be the case. All in all, you can wear these boots all year round. Should be no issues at hotter times of year in terms of breathability and they will perform well in the Winter too, within reason of course. They weigh in at around 3.5 lb /1.5 kg (pair). Weight is probably one of the chief features of the design of these boots. As mentioned above they are designed for backpacking and as such, they are aiming to be as lightweight as possible while still maintaining all the support, sturdiness, strength and durability you would expect from a pair of tough leather backpacking boots. It's worth keeping that in mind though, that while these boots will work fine for light day hiking, they are a good deal chunkier that many hikers may need or want. They are designed for load carrying first and foremost. The next thing to look at is sizing. From all the reviews I read across various retailers, the Salamon Quest 4D 2 GTX hiking boots fit true to size, so nothing major to report in that area. With regards to break-in, the 4D 2 GTX boots are most definitely more flexible, in terms of their construction, than the average pair of leather backpacking boots. Again, they're designed to be that way. With that in mind, you can expect a much shorter break-in period than for a pair of leather backpacking boots. I don't think it would be wise to expect them to be ready to rock straight from the box though, but I did see some folks saying that, that was their experience. At the back of the boots, as shown in the picture above, we have standard boot loop pulls. It's worth noting the size of these boots in the picture above. The shaft measures 6.75 inches from the arch so again, that's a clear indication that they're built with a high shaft to provide more ankle support for heavy loads on the trail but we'll look at that in more detail in the next section. A backpackers boot through and through! Now, I finished off the last section looking at the height of the shaft of these boots. Technically, that should probably really be in this section as this is where it is all about support and stability, but as these boots are designed as backpacking boots, I figured it was OK to mention that in the Comfort section too. So, with that in mind, our 6.75 inch shaft rests on a molded EVA midsole. We've touched on the merits of EVA above in terms of the footbed but now let's look at the midsole. Just in case you aren't familiar with it, the midsole is the part of the shoe that sits between the outsole and the insole. It also acts as a shock absorber and helps distribute impact from the trail evenly across your foot. you can learn more about the main constituent parts of a hiking boot here. The next thing I wanted to highlight, is the protective rubber heal cap, see the picture below. Not only does this work with the 4D Chassis, EVA footbed and midsole in terms of stability and impact protection, but it actually provides an additional wall of protection for the back of your feet and ankles. Not to labor the same point, but the shank of the boots is strong and stable by design. The combination of EVA, nubuck leather and Gore-tex on the sturdy under layers of the 4D chassis outsole, as well as the mid and insoles, means you are assured a very stable and solid fit ... aka: great foot and ankle support. Next up we come to a very functional feature in the Salomon Quest 4D 2 GTX boots, the Contragrip outsole. Basically, if we look at the picture below, the selection of lugs on the outsole of the boots is impressive. The shorter grooves in the opposing lugs enable good grip on sturdier terrain, for example a rocky surface, while the deeper grooves around the lugs mean that you can still expect good grip over less stable terrain, for example slippy mud. From all the reviews I checked out on these, this aspect came up good time and again, folks were very pleased with the grip provided by the 4D 2 GTX boots without comfort being sacrificed. It's worth taking a closer look at the lugs in the picture below. Looking from a side angle you can see how aggressive they actually are. As mentioned, this excellent grip and traction capability doesn't come at the cost of comfort. The 4D chassis design works with the tough outsole to ensure comfort is maintained and your weight is evenly distributed across the boots. Next up, let's look at the toe box, another nice feature in these boots. It can sometimes seem like a basic enough thing but a good toe box, one that really works, is a really nice feature to have in hiking boots. Any manner of things can damage your front toes if they're not adequately protected so good protection in that area on the trail is always a nice to have. If you're walking up through a slippy hill with a heavy pack on, having a hard toe box to help kick in little support divots, can also be really handy. The Salomon 4D 2 GTX boots come with a 1 year warranty from the date of purchase. Salomon are a well known and respected brand so if you were to have any issues, you can expect them to be sorted out quite quickly. I actually came across one user review where the Guy had actually bought the original version of these boots and about four months in, one of the lower plastic eyelets broke. He contacted Salomon and they sent him out a new pair of the new Quest 4D 2 GTX boots. How's that for good service! The retail price comes in at the high end for hiking boots, but if you shop around, you should find a deal. Click on the image at the start of this article or any of the links throughout to be taken to Amazon to get a live price. Based on all the reviews I have read, the construction, the brand, etc. 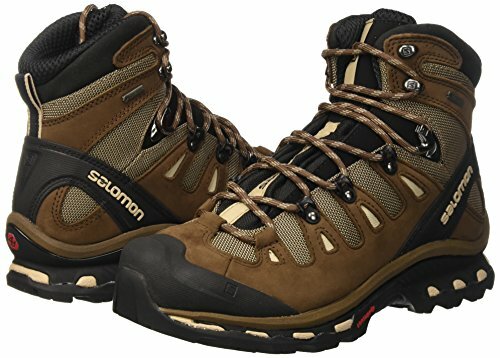 I think that overall, the Salomon 4D 2 GTX Hiking Boots for men are an excellent pair of quality boots for the price you pay. They're not the cheapest for sure and lean towards the higher end of the pricing range, but I think their special design warrants the price. A lightweight backpacking boot is a pretty cool thing and to enable that to be the case while still maintaining a sturdy and strong boot, I would expect it to cost a bit more than average. They'll work fine for day hiking too but overall I would say they are primarily designed as a backpacking boot. The downside, is that as they are a technical boot with lot's of seams and stitching. Once they start to lose their use, say they rip or break, you can't do anything with them, they're more or less finished. A good traditional leather pair of backpacking boots, if well looked after, can last for decades if they can be resoled. I don't think this takes away from these boots though as they do offer something very good in terms of weight and performance so they're designed and constructed accordingly i.e. there has to be a trade off of some kind. Yep, these are definitely first and foremost a great pair of backpacking boots. However, they will work great for all types of hiking all year round, within reason in terms of winter of course. They will work great on well worn trails and also keep you good should you fancy going off trail for a bit. In summary, if you're a backpacker, these are definitely worth a look. Even as a day hiker, they will work well but they are a bit more chunky than you may need if you only ever do light day hiking. As mentioned, they'll be good for going off trail so really, nearly any kind of hiking should be fine in them. For a newbie hiker, there may well be too much in these boots than you might need to get started but again, that doesn't rule them out! I think a good pair of starter day hiking boots are the Alico Tahoe Hiking Boots for men, they might be worth a look if you're just starting out. However, in saying that, the upside about getting these boots even if you are a newbie hiker, is that if you are confident you're going to be expanding your hiking horizons, the Salomon Quest 4D 2 GTX hiking boots should be able to cater for all of your needs as you move onward and upward into bigger hiking and / or backpacking challenges. 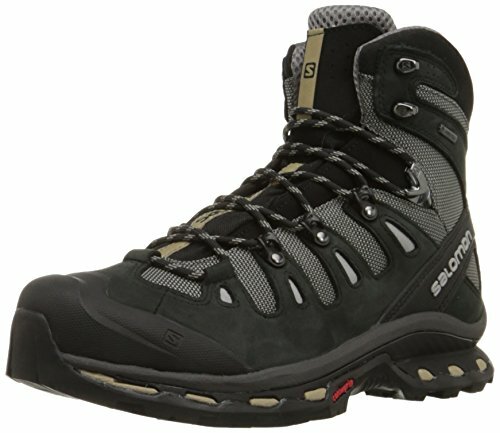 As of the date of this post, from about 300+ reviews I checked out, across multiple retailers, 97% gave the Salomon 4D 2 GTX boots 3 stars (out of 5) or more, 93% 4 stars or more and 81% gave 5 stars so some great scoring! In conclusion, the Salomon Quest 4D 2 GTX Men's Hiking Boots do seem to be continuing in the same vein of popularity and performance as their predecessor. They're an excellent lightweight backpacking boot and will fit the bill for many established hikers. Overall, I think you are getting pretty good value for money as long as you know what to expect from them. They won't last beyond a few years hard use by my estimation, which I think is a decent enough period of use for the price. I stress that's not a criticism, likely just a fact based on the way they're constructed, but to get those advantages in terms of weight and so on, they have to be made the way they are. If you're still unsure what type of hiking boots you should get, check out the hiking boot buying guide and my hiking boot recommendations. I hope you found this review useful. Please comment and / or share it around your networks if you did. Do you use the Salomon Quest 4D 2 GTX hiking boots? What is your experience with them? I bought a pair of Salomon GTX 4D 2 hiking boots in August 2016. The size of these boots is the same as my shoe size of US and Canada 9.5. I wore them for my weekly hiking trips for 10-15 km to break in these boots. The purpose is to prepare myself for my Annapurna Circuit trekking in mid-October of 2016. I tied my boots with loosely for comfort, i.e., tying first two adjacent eyelets from the front together before crossing in a parallel manner between left and right sides and before criss-cross tying for the rest of the boots up to the neck. A pair of woolen thermal sock was used throughout the trip of about 13 days on the trails. The trails were rugged and strenuous. On descent from Thorung La Pass (5,416 metres) to Muktinath (3,760 m) within 8 hrs), four of my toes on my left foot developed bruises and blisters, and as a consequence, the toe nails of these blistered toes came off later. Toes on my right foot were unharmed. Trekking poles were used for the trekking all the time. Salomon did not respond to my request for technical explanation for the differential injury. Please let me know the reasons why this happened? Hi Andrew, that sounds really unfortunate what happened to you. I can’t really provide any useful commentary as to why that may have happened, there could be any number of factors involved. I hope you are doing better now and you’re planning more exciting hiking adventures. The Annapurna Circuit looks really beautiful.